Leaders from the Falmouth Jewish Congregation and from Saint Barnabas Episcopal Church addressed the crowd, denouncing the bigotry on display in Pittsburgh and meditating on how the community can respond to such an act of violence. We spoke with Rabbi Lieberman and Olivia Masih White of No Place for Hate about the event. The Groundbreaking ceremony for our expanded Falmouth Community Media Center facility was held at the end of October. 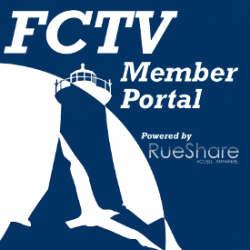 We spoke with CEO Debra Rogers about what this means for FCTV. The newly-formed FHS Unified Basketball Team hosted its first home game with a double header against Plymouth North and Plymouth South on Wednesday, October 24th in the FHS Field House. This unique team is sponsored by MIAA and Special Olympics in a very worthy partnership. This past Sunday marked the 41st running of the Cape Cod Marathon. Approximately 1300 participants assembled at the Falmouth Village Green starting line to run the current course for the last time. Next year, Marathon officials are planning a completely new course. We met with new Race Director Jack Afarian and former Race Director Courtney Bird to talk about the race - past, present, and future. Visitors to Main Street in Falmouth are bound to see the scarecrows that our local merchants have displayed to decorate our downtown. Patricia Cosgrove from the Falmouth Village Association tells us more about the Village of Scarecrows competition. The Visit with a Night Watchman was created a decade ago by Tamsen George, the museums’ current board chairman, to present local history in an unusual way and to create a family-friendly event for the community. Lisa Jo Rudy and Peter D. Cook of Not My Monkeys Productions produced the event for the second consecutive year, bringing their extensive theatrical experience to the annual haunting. Leaders from the Falmouth Jewish Congregation and from Saint Barnabas Episcopal Church addressed the crowd, denouncing the bigotry on display in Pittsburgh and meditating on how the community can respond to such an act of violence. Fairwinds Clubhouse provides behavioral health services to improve the quality of life for individuals living with mental illness and addictions.